If you are planning to work at sea then you must have a Medical Fitness Certificate to prove that you don’t have any serious medical conditions that could prevent you from performing your duties. If you work onshore and the worst were to happen then help would probably arrive quickly, however, at sea medical treatment can be days away. Therefore, seafarers are asked to complete a medical fitness test to minimise the risk of medical emergencies at sea. Almost all crew who are looking for a job on a Superyacht will be required to hold a valid ENG1 Medical. The only exception to this rule is if you are working on a small vessel operating no more then 60 miles from shore. In this case an ML5 will suffice. It’s fair to say that almost all Superyachts venture more than 60 miles from land so crew will be required to hold a valid ENG1 Medical certificate. The ENG1 Medical lasts for two years so if you are about to join Flying Fish but are not planning to go to sea for some time, do consider the two year expiry date. 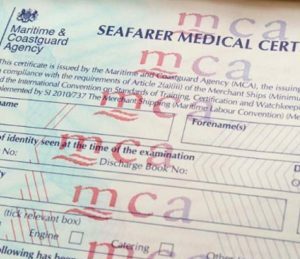 The MCA have set a maximum fee for the ENG1 Medical Certificate of £80. Please be aware that there is a high demand for the ENG1 Medical and it can sometimes take two weeks to get an appointment. We recommend that you book early. Flying Fish recommend that all customers who are looking for a career at sea complete the ENG1 Medical before training begins, though it is not mandatory to do this prior to completing your course with us. The ENG1 Medical takes about 45 minutes to complete. You will need to take a form of ID (passport or driving licence) and any glasses you use for reading with you. The Doctor will measure your height, weight, blood pressure and ask for a urine sample, to check for diabetes. He will listen to your lungs, look in your ears and check your vision by asking you to read a short passage from a book. You will be asked questions about your medical history and the Doctor will perform the Ishihara colour vision test. Most people complete their ENG1 Medical with no problems at all, however, if you suffer from any of the following conditions then it is unlikely that you will receive an unrestricted ENG1 Medical certificate. If you are or think you are colour blind, affecting your ability to distinguish lights, you should consider having a full eye test conducted by a Optometrist to check vision before joining Flying Fish. Alternatively any doctor can conduct the Ishihara test and if you pass you can be confident that colour blindness will not be an issue for your ENG1 or ML5. If you fail the Ishihara your doctor will need to place a restriction on your ENG1 or ML5 medical certificate. You can consider having a “CAD” test conducted at several universities across the UK. If you are aware of any medical conditions that may affect your chances of getting an ENG1 or ML5 then please see use the following Merchant Shipping Notice (MSN) for details on how Doctors determine whether to put a restriction on your medical certificate. MSN 1839 is a comprehensive guide to the medical test which includes a list of conditions and whether or not those condition will require further examination. Please refer to Annex A, which starts on page 15. You will see a list of medical conditions with further notes in columns to the right. You will notice numbers 1 to 3 by the side of the notes. These numbers allow the Doctor to determine whether the patient is fit to go to sea. For any seafarers looking to work on Ships or Superyachts an unrestricted, Category 1 ENG1 Medical certificate is required. If you have any questions then feel free to contact us. Consider the ML5 Medical if you are applying for positions as Skipper or crew of a Small Commercial Vessel certified for Category 2 waters (no more than 60 miles from a safe haven). If you are working close to home, then the ML5 Medial Certificate is preferred. Take this form to your GP who will be able to complete the medical for you. To work as a professional Yachtmaster you need either your ENG1 or ML5 to support commercial endorsement of your qualification. Flying Fish recommends ENG1, which validates Yachtmaster Offshore to 150 miles from a safe haven and Yachtmaster Ocean on an unrestricted basis. ML5 limits you to 60 miles.